Water resources planning objective. 2. Socio-economic factors. 3. Economic principles. 4. Systems analysis and optimization. 5. Decomposition of complex systems. 6. A planning model. 7. Reservoir sizing. 8. Hydrometeorological network design and data collection. 9. Soil erosion and sedimentation. 10. Irrigation. 11. Rural water supplies. 12. Hydro electric power development. 13. Human resources. 14. Environmental and social impact assessment. Author index. Subject index. Water resources exploitation has been regarded as a way of initiating economic development in many countries. Planning concepts are now changing. Thorough environmental studies, sociological and economic studies now preceed project formulation. Justification solely on the basis of benefit cost studies is no longer sufficient for many development agencies. The broader approach is introduced in this book, but the real emphasis is on the situation in and needs of developing countries. 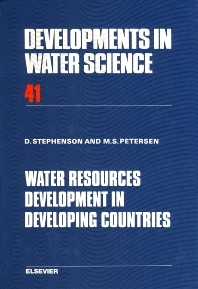 Some of the problems experienced in building water resources in developing countries are described in this book, and methods of solution based on the limited experience of the authors, are offered. These range from use of unbiased common sense, coupled with a close understanding of people's requirements, to a comprehensive computer simulated planning model. Some types of water resources development are described in more detail. These include irrigation, hydro electric power and rural water supply. Sections on socio-economics and human resource development are also included, as well as on data collection, and project planning. Lessons from the failure of multimillion dollar projects are not hard to come by, and examples and pointers which will assist future planners are given. Attention is paid to the need for aid to include training and to stimulate local economies. However big water projects appear, they cannot escape the effects of the rest of the country's economy. Attention is also drawn to environmental problems, particularly soil erosion, often caused by water resources development. The fact that water resources development cannot be carried out by engineers only, is recognized. The input of many professions, and vast experience, is needed. Drawn on international case studies, much of the material has been presented in postgraduate courses by the authors.